Acicular crystals have a needle-like shape that tapers to a point or a blunt termination. Many acicular crystals can be clustered to produce fan-shaped or radially-shaped aggregates. 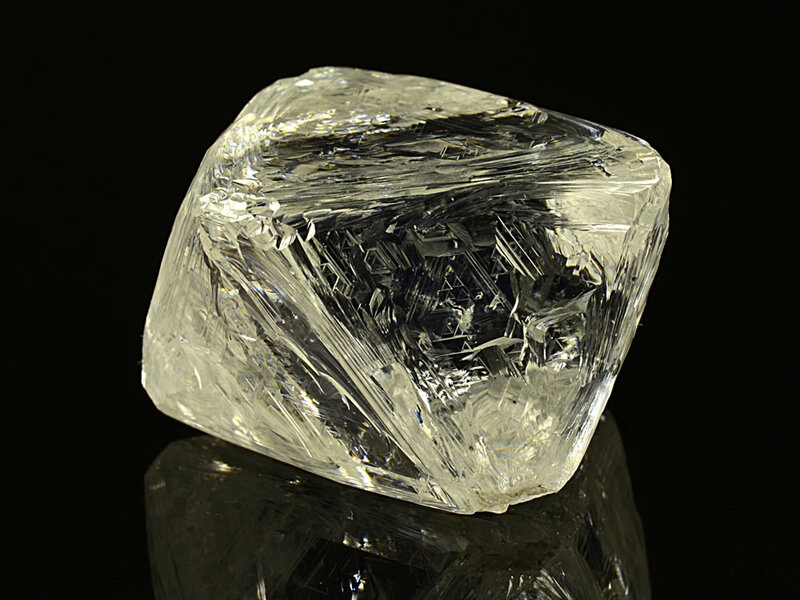 The name acicular should be used when the length of an individual crystal is much greater than its width or diameter. 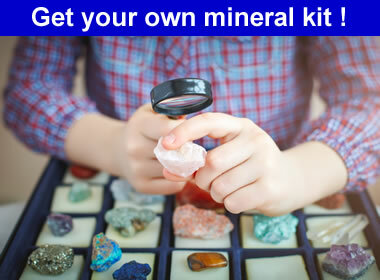 Mineral examples include rutile, natrolite, millerite, and gypsum. This geode found in Kentucky contains thin needle-like crystals of millerite. This specimen is also a good example of the geodic habit. Specimen and photo by Arkenstone / www.iRocks.com. Banded minerals have narrow layers or bands of different color and/or texture. These may be a response to changes in the composition of the growth liquid, the sedimentary process, or other conditions. Mineral examples: quartz (agate), malachite, rhodochrosite, and fluorite. 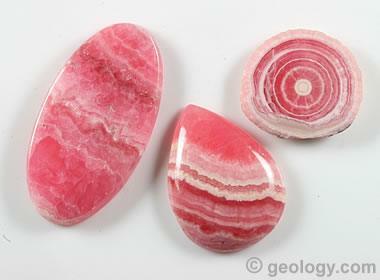 The photo above shows rhodochrosite cabochons that display a banded habit. In one of the cabochons, the banded habit is actually an internal feature of a stalactitic habit. The cabochons were cut from material mined in Argentina, and the cabochon on the left is about two centimeters in length. Crystal habit is an external shape displayed by an individual crystal, but more often it is an external shape displayed by an aggregate of crystals. Crystal habit names are often adjectives that help convey the shape of a crystal or a group of crystals. Bladed, cubic, fibrous, granular, prismatic, and radiating are names of crystal habits that quickly convey a generalized geometric appearance. Other crystal habit names are less familiar, but once a person learns the name it can easily be applied to mineral specimens to which that habit applies. Many minerals have characteristic habits which can serve as clues to their identification. However, many minerals do not have a characteristic external shape, and the name of this habit is “massive”. In addition, most specimens of any mineral do not display a characteristic habit. In rare instances, one mineral might replace crystals of another mineral to assume its characteristic habit. Crystals formed in this situation are known as pseudomorphs. Bladed crystals are elongated. They are much longer than they are wide, and their width exceeds their depth. They are shaped like a straight sword or knife blade. Their ends sometimes taper to a point. They might exist as single crystals, a cluster of many parallel crystals, or radiating clusters of crystals. Mineral examples: kyanite, actinolite, and stibnite. These blue crystals of kyanite have a bladed habit. 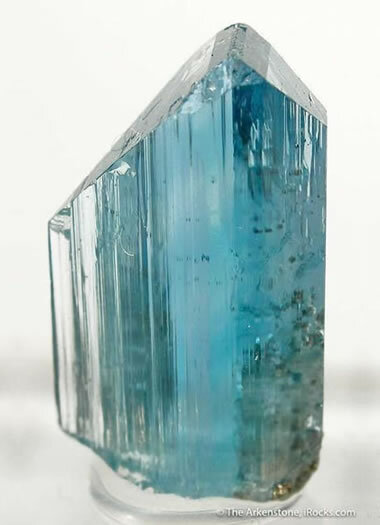 Kyanite crystals are interesting because they have a hardness of 4.5 to 5 parallel to the length of their blades, and a hardness of 6.5 to 7 across the width of their blades. This specimen is approximately seven centimeters across. Image by Aelwyn, used here under a Creative Commons License. 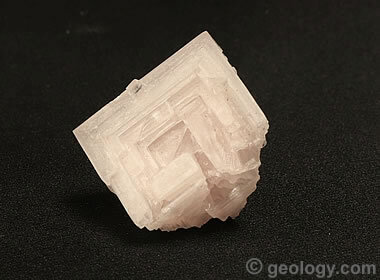 Columnar crystals are long prisms with enough width that the name acicular (or needle-like) does not apply. A single "column" might contain multiple parallel crystals. Mineral examples: calcite, tourmaline, and gypsum. 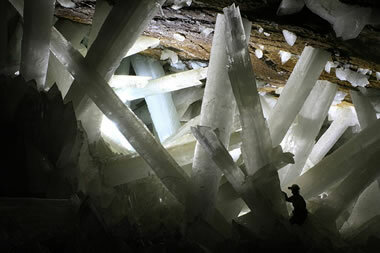 These enormous crystals of selenite gypsum have a columnar habit. They are in the "Cave of the Crystals" cavern, Chihuahua, Mexico (a person in the lower-right quadrant of the photo serves as scale). These are some of the largest well-formed crystals in the world. The photo is a Wikimeida OTRS image by Alexander Van Driessche. Botryoidal (also known as globular or mammillary) is derived from the Greek word "botruoeidēs", which means "bunch of grapes". This habit name is used for crystal aggregates that have a globular or rounded shape. Mineral examples: hematite, malachite, smithsonite, hemimorphite, variscite, quartz (chalcedony), and goethite. 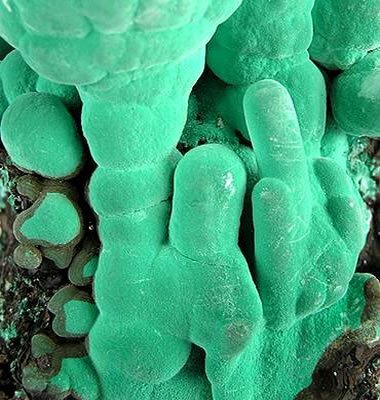 These green crystal aggregates of malachite have a botryoidal habit. This view spans an area of the specimen approximately five millimeters across. Specimen and photo by Arkenstone / www.iRocks.com. 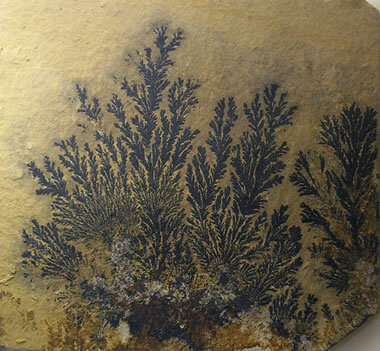 Dendritic crystals form a branching pattern, much like the branches of a tree, the veins in a leaf, or the branching pattern of streams in a drainage basin. Mineral examples: copper, pyrolusite, and other manganese oxide minerals. These crystals of pyrolusite formed on a bedding surface of a piece of lithographic limestone collected near Solnhofen, Germany. The image is a public domain photograph created by Aram Dulyan at the Natural History Museum of London. 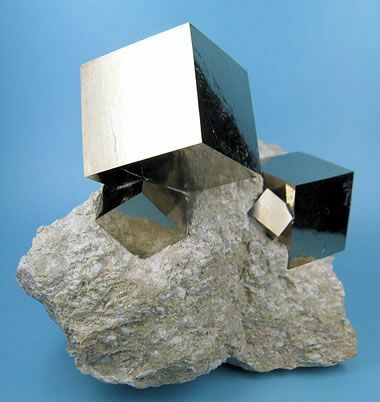 Cubic crystals of pyrite. Fluorite and halite are two common minerals with a cubic shape. Cubes have six square faces and four-fold rotational symmetry around three axes. The photo shows cubic crystals of pyrite from Navajún, Rioja, Spain, that have grown in a marlstone. Specimen is approximately 4 inches (9.5 centimeters) across. Image by Carles Millan and used under a Creative Commons license. Drusy is a habit name used for a surface that is covered with small crystals. The crystals themselves are referred to as a druse. Quartz is the most common mineral found as a druse. 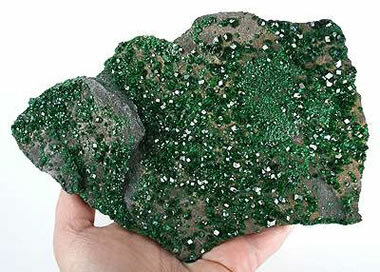 Other mineral examples: uvarovite garnet, malachite, and azurite. The rock in the photo above has a drusy surface because it is covered by a layer of uvarovite crystals. 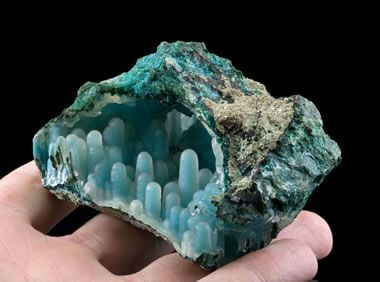 This rock was collected from the Saranovskii Mine, located in the Urals region of Russia. It is approximately 18 x 13 x 2 centimeters in size. Specimen and photo by Arkenstone / www.iRocks.com. 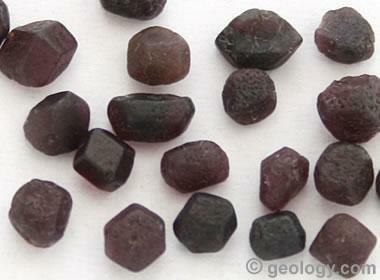 Dodecahedral garnet crystals about four millimeters across, from Idaho. A dodecahedron is any polyhedron with twelve flat faces. The dodecahedron is one of the most common forms for garnet crystals. 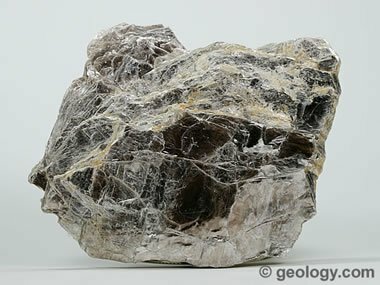 Fibrous is a habit name used when minerals occur in very fine fiber-like crystals. They are often so fine that they look like fine hair. The habit also includes aggregates made up of a large number of parallel or radial fibers. Mineral examples: actinolite, chrysotile, serpentine, and tremolite. 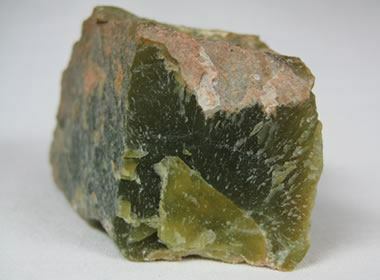 The actinolite crystals on this rock have a fibrous habit. 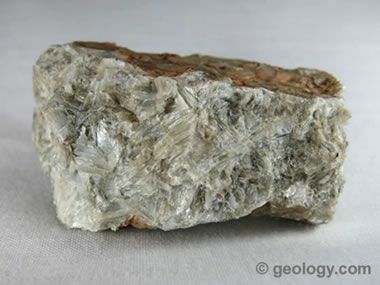 Because of their fibrous shape (a roughly 1:20 aspect ratio) and properties, fibrous crystals of actinolite are regulated as asbestos. This photo is a Creative Commons image published by Didier Descouens. Geodic is a habit in which mineral aggregates form a rounded or oblate mass by crystallization on the inside walls of a cavity. Concentric bands or layers of mineral crystals subsequently develop, gradually infilling the cavity without infilling it completely and with a crystal-lined central void. 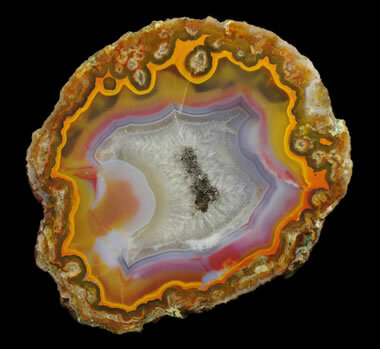 The specimen in the photo is a geode formed by the precipitation of banded agate to form the external wall and initial layers. The center of the geode is lined with quartz crystals. Image copyright iStockphoto / WojciechMT. Foliated (also known as Micaceous) is a sheet-like or layered structure. Minerals with a foliated habit are often able to be split into thin sheets. Members of the mica family are the best examples of a foliated habit. Clay minerals and graphite can be described as having this habit, but their foliation is on a microscopic scale. Mineral examples: muscovite, biotite, and chlorite. 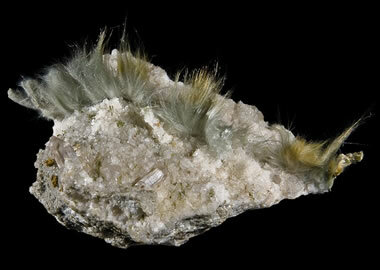 This specimen of muscovite exhibits a foliated habit. The mineral can easily be separated into very thin sheets. The specimen is approximately 5 centimeters across. Hopper crystals are partially formed crystals that have experienced more rapid growth on their outer edges than in the center of the crystal. This causes them to be well-developed on the outer edges but less developed or "hollow" in the center. Halite (shown above) is one of the best-known examples of a mineral that sometimes displays the hopper crystal habit. Other mineral examples: galena and ice. Granular is the habit of a crystalline aggregate composed of many rounded or equant anhedral crystals of approximately the same size. The crystals might be loose with no interstitial material, or they might be interlocking such as calcite grains in a marble. Mineral examples: olivine, bornite, and scheelite. 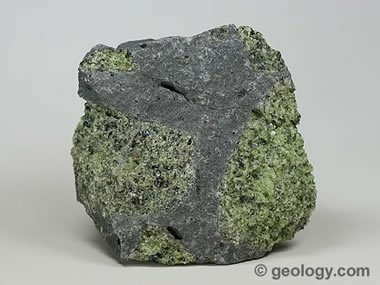 The photo shows a specimen of granular olivine in basalt. The olivine is in small rounded grains of about 2 to 4 millimeters in size with no interstitial material. Nodular is the name of a habit in which mineral crystals grow to form rounded or bulbous structures. The crystals are usually arranged in a radial structure within the nodule, even though the nodules may exhibit concentric banding. In the concentric banding, each layer is composed of crystals growing up and outward from the layer immediately below. Mineral examples: quartz (agate), azurite, hematite, realgar, and variscite. 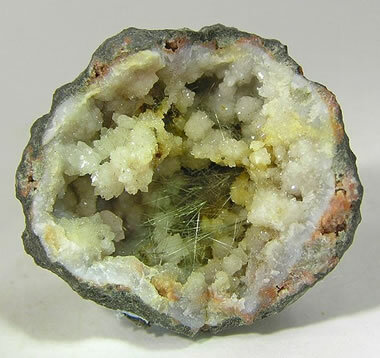 A nodule of variscite (bright green), crandallite (canary yellow), wardite (gray) and montgomeryite (dark green). 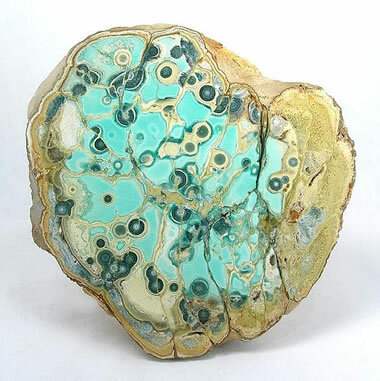 The nodule is approximately eleven centimeters across and was found in Utah County, Utah. Specimen and photo by Arkenstone / www.iRocks.com. Massive is the habit name used for masses of crystals that have no distinctive geometry. Most specimens of almost every mineral do not exhibit an obvious habit or obvious crystal form. Shown above is a specimen of lizardite serpentine from Wayne County, New York. The piece has no visible internal structure or characteristic external shape. Oolitic minerals occur in crystalline aggregates that are rounded and less than about four millimeters in size. Oolites form by chemical precipitation from a solution. Similar to pisolitic, but oolites are much smaller than pisolites. Mineral examples: hematite and calcite. A specimen of oolitic iron ore approximately ten centimeters across. The largest oolites are a few millimeters across. Octahedral diamond crystal, yellow in color and weighing 98.63 carats, recovered from the Jubilee (Yubileynaya) Pipe, Sakha Republic, Russia. The crystal measures approximately 29 x 28 x 27 millimeters and contains inclusions of olivine, graphite, and sulfide minerals. This diamond crystal is extremely interesting because its surface is covered with triangular dissolution features. Octahedrons have eight triangular faces and three axes of four-fold rotational symmetry. Click to enlarge. 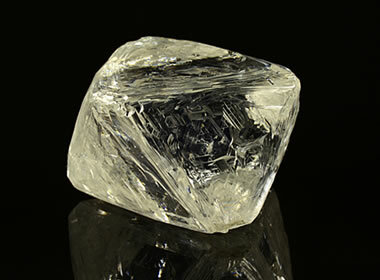 Image by ALROSA. Prismatic is a habit name for minerals that form in elongated crystals with opposite faces normally parallel to one another. The crystals are often striated along their length (as in tourmaline) or across their width (as in quartz). Mineral examples: tourmaline, quartz, beryl, hornblende, augite, diopside, and topaz. 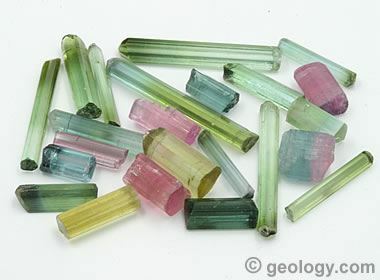 Shown in the photo above are prismatic crystals of colorful tourmaline from Afghanistan with striations parallel to their long axis. The largest specimen in this photo is about three centimeters in length. 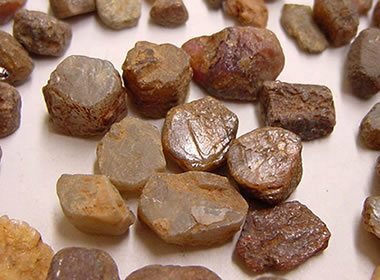 Pisolitic minerals occur in crystalline aggregates that are rounded and about the size of peas. 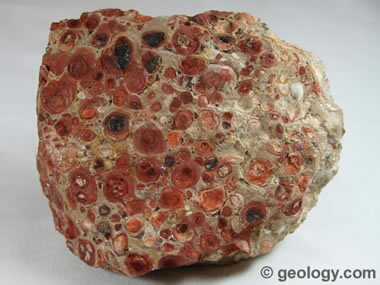 Individual pisolites are made up of many tiny radiating mineral crystals. They often develop a concentric structure formed when crystalline aggregate layers grow to enlarge the pisolites. Similar to oolitic, but pisolites are much larger than oolites. 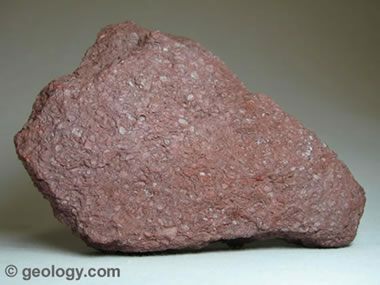 Mineral example: bauxite. The specimen of bauxite in the photo is about six centimeters across and contains numerous pisolites that are about the size of peas. Rosettes are clusters of tabular crystals in a radial arrangement that have an external geometry that resembles a rose or flower. Barite and gypsum sometimes form crystals of this shape in sand to produce a rosette with a sandy appearance. Mineral examples: barite, gypsum, pyrite, and marcasite. 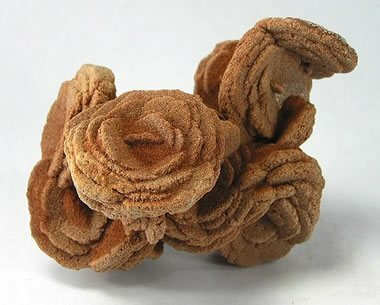 The photo shows a "barite rose" which formed when a cluster of barite crystals grew in sand, incorporating many of the sand grains within each crystal. Specimen and photo by Arkenstone / www.iRocks.com. Radiating crystal aggregates grow outwards from a central point. They consist of multiple crystals growing in diverging directions. Mineral examples: wavellite, pyrite, rutile, and kyanite. The photo above shows a massive aggregate of kyanite crystals, many of which form radial clusters. The specimen is approximately five centimeters across. Striations are fine, slightly indented lines that are present on the faces of some crystals. They always parallel a crystallographic axis and one of the edges of that crystal face. Mineral examples: pyrite, tourmaline, quartz, feldspar, euclase, and topaz. 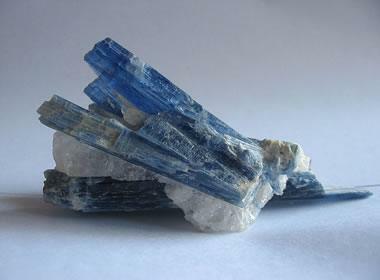 The photo shows a crystal of blue euclase with striations on its faces that parallel the long axis of the crystal. This specimen is also a good example of the prismatic crystal habit. Specimen and photo by Arkenstone / www.iRocks.com. Stalactitic is a habit name used for specimens that have formed as stalactites or stalagmites. The crystals often grow downwards or upwards in a cavity or cavern, yet they have a radial internal cross section. Mineral examples: calcite, malachite, goethite, and quartz. The photo shows a geode with stalactites of gem silica (inverted) from the Inspiration Mine, Gila County, Arizona. Specimen and photo by Arkenstone / www.iRocks.com. Tabular crystals are flat and plate-like. They have lengths and widths that are much larger than their thickness. An easy way to describe their shape is to compare them to a tablet computer or a tablet that you use to write notes. Mineral examples: feldspar, topaz, barite, and corundum. The photo shows tabular segments of a corundum crystal that separated along planes of parting. United States Geological Survey photo by Andrew Silver.